The statue of President Abraham Lincoln depicts him with a serious, contemplative expression. Sculpted by the first female artist commissioned to create a work of art for the United States government. Abraham Lincoln was born on February 12, 1809, in a log cabin near Hodgenville, Kentucky. His farming family moved frequently, settling in Indiana and then Illinois. Lincoln had little formal education, but he borrowed and read books wherever they lived. In young adulthood he worked as a laborer, ferryman, storekeeper, surveyor, Illinois state legislator, and circuit-court lawyer. In 1842 he married Mary Todd; the couple had four children, of whom only one lived to adulthood. Lincoln was elected to the U. S. House of Representatives in 1846 but served only one term before resuming his law practice. In 1854, however, Congressional action undermining the antislavery cause drew him back to politics. After opposing pro-slavery candidates for the Senate, he was nominated as the Republican candidate for president. He won the election in 1860, but by the time he assumed office in March 1861 seven states in the South had seceded from the Union. 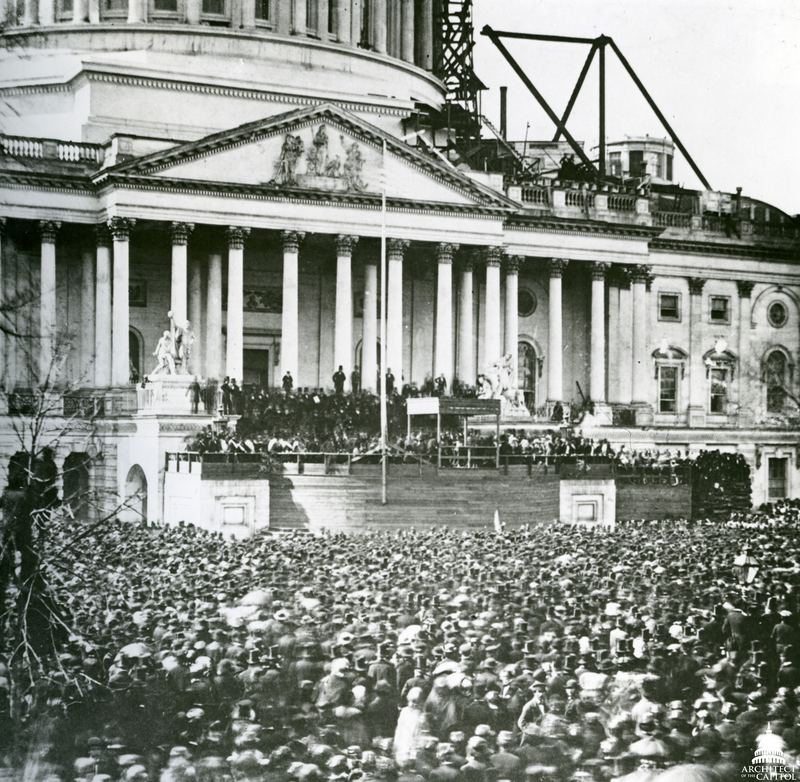 Lincoln's inauguration at the Capitol 1861. The Congress and his own fractious cabinet proved a formidable challenge to the new president's administrative abilities. However, his political skills and his unpretentious yet eloquent way of speaking won him critical support and loyalty. His conviction that the Union must be restored never faltered, and he initially managed the conduct of the war personally. Disappointed in the generals who headed the military effort, he at last found in Ulysses S. Grant a capable and determined officer to whom he could entrust overall command. A milestone of his presidency was his issuance on January 1, 1863, of the Emancipation Proclamation, which declared that all slaves in states still in rebellion were free. 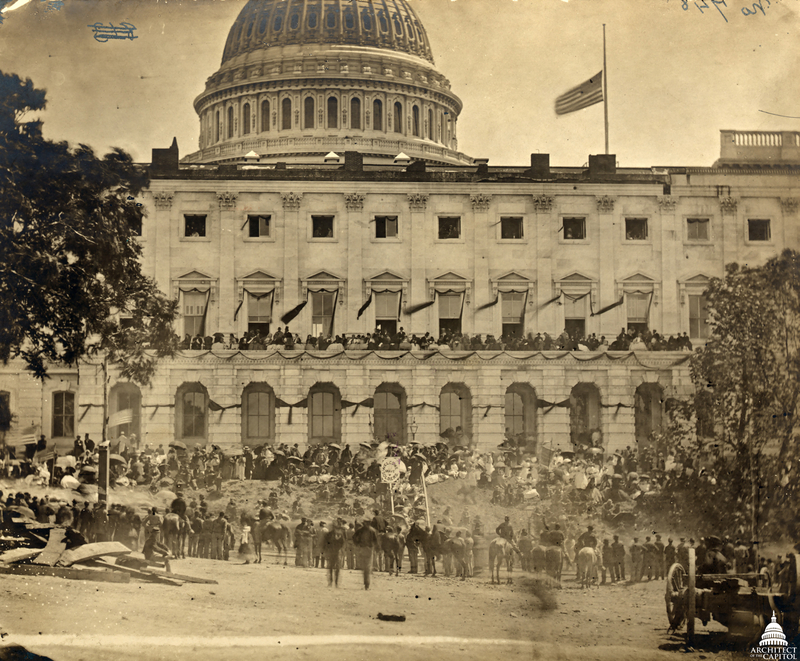 The Capitol hung with black crepe and flag at half-mast following Lincoln's death in 1865. Lincoln was reelected in 1864, in large part because the tide of the war had turned in favor of the Union. By this time he had become committed not only to restoring the Union and emancipation but also to extending civil rights and the vote to freed slaves. Anticipating the Confederate surrender, he intended that the reconstruction of the South be generous rather than vindictive, despite congressional preference for harsher action. However, he was never to see his goal accomplished. On April 14, 1865, he was shot by Southern partisan actor John Wilkes Booth while attending a performance at Ford's Theater in Washington, D.C., and he died the following day. Lincoln's body lay in state on the catafalque in the Capitol Rotunda and was taken to Springfield, Illinois, for burial in Oak Ridge Cemetery. The statue of President Abraham Lincoln in the Rotunda of the U.S. Capitol depicts him with a serious, contemplative expression. He looks downward at his extended right hand, which holds the Emancipation Proclamation. Lincoln wears a bow tie, a single-breasted vest and the double-breasted frock coat that he wore to Ford's Theater on the night of his assassination. A long, flowing cloak is draped over his right shoulder and arm, clasped in his left hand. His right leg is slightly bent, and the toe of his right boot projects beyond the front of the self-base. The name of the sculptor, Vinnie Ream, is inscribed on the side of the self-base. The name "ABRAHAM LINCOLN" is carved in relief on the front of the marble pedestal. The red granite base, on which the pedestal stands, was added in 1877.